Hello everyone, as you all know, I do a lot of baking with yeast over here at Food Wanderings. This year I am kicking off a new Baking with Heritage series, asking baker friends to contribute a baking with yeast recipe from their tradition and background. If you bake with yeast, and would like to guest in this series, drop me a note. To inaugurate this series I have here the very talented Roxana of Roxana's Home Baking, with her grandmother's Romanian flat bread. Thank you Roxana for sharing this heirloom recipe with me and Food Wanderings' readers. Please hop over below and get a pretty wholesome look at what Roxana is all about. Make sure to follow her baking endeavors! Hello Food Wandering fans! For those of you who do not know me, allow me to introduce myself. My name is Roxana and I'm the baker, writer and photographer behind Roxana's Home Baking - where passion meets cravings. My blog is focus on baking everything from scratch no matter if it's just a simple cookie, bread or a layer cake. I'm passionate about baking, especially yeast breads and lover of all things chocolate. I just recently started a mini series about Bread Baking. When Shulie asked me to bake a bread that reminds me of my homeland, Romania, I knew I had to share the recipe for a flatbread my Grandma used to make us almost every week. I have lots of memories about my Grandma, but most of them involve bread baking. She loved baking bread for our big family. She'd start by sifting the flour in the big oval wooden bowl while we'd happily gather twigs for the wooden oven to heat it up. Most of the time a big chunk of the dough, after it had risen was made into fried doughnuts which we'd sprinkle heavily with sugar for a mid-week sweet snack and the rest of the dough was divided and rolled out to make bread. Carefully my Grandma would poke holes in the dough not to allow it to rise too much. Although I like mine plain or just brushed with olive oil and sprinkled with nigella seeds, from time to time I love roasted tomatoes inside the bread while it bakes. The juices coming out of the grape tomatoes are keeping the bread soft, not soggy, and add lots of flavor. In a mixing bowl sift the flour and make a well in the middle. Add the 1/4 cup lukewarm water and sprinkle the teaspoon of yeast on top of it. Stir to combine the yest with the water and just a little bit of the flour and leave at room temperature for about 5 minutes or until the yeast mixture foams and bubbles appear. Separate you can mix the yeast, water and 1/4 cup flour and then add it to the remaining flour. Add the dough hook to the mixer and slowly add the olive oil, sugar, salt and enough water to form a soft elastic ball of dough that cleans itself from the sides of the bowl. I used almost 1/2 cup water. Place the dough into a greased bowl, cover with plastic wrap and leave at room temperature until doubled in volume. Meanwhile heat the oven to 400F. When the dough has risen, take it out and with a rolling pin or simply with your fingers flatten it on a piece of parchment paper or baking mat. Leave to rest 5-10 minutes, press the tomatoes in the dough and bake for 20-25 minutes (depending on how think you rolled it) or until slightly brown. Beautiful! Perfect with feta cheese. Shulie, loved the post and the snapshots! This is a wonderful series idea Shulie! Flatbreads are one of my favorite things, so many options. And I know nothing about romanian breads, so this is a wonderful way to start. This flatbread sounds wonderful! Love all those roasted tomatoes nestled in the bread. I also love the idea of Baking of Heritage and look forward to seeing all the recipes as they are posted. I like the Idea Shulie, and asking foodie friends to guest post at your blog will introduce us to few more. Beautiful bread and clicks. 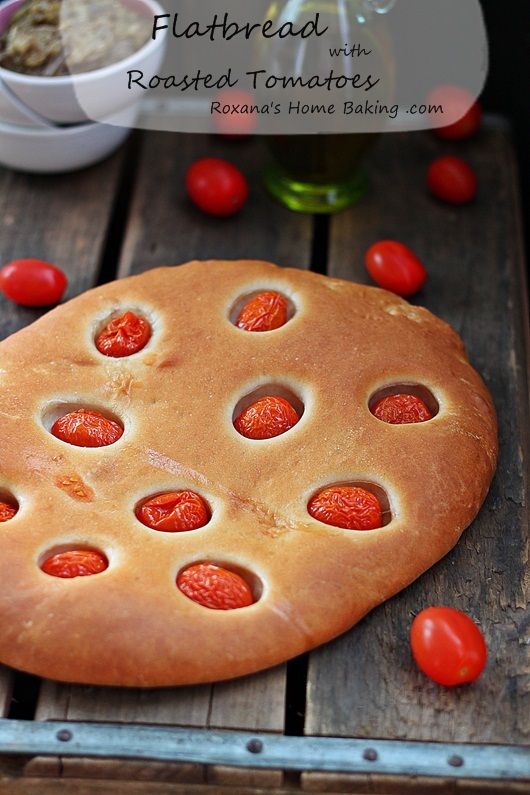 Such a beautiful flatbread, I love the roasted tomatoes! I love roasted tomatoes just about more than anything. 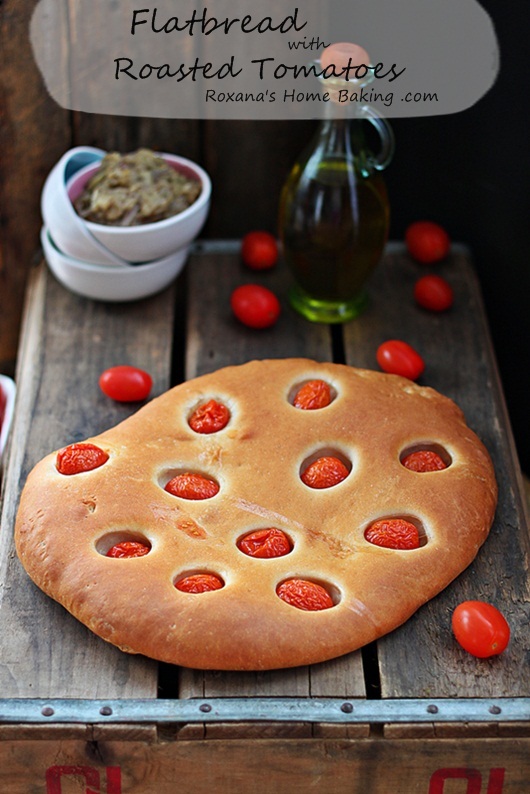 This flat bread sounds lovely! That looks so yummy and pretty too! 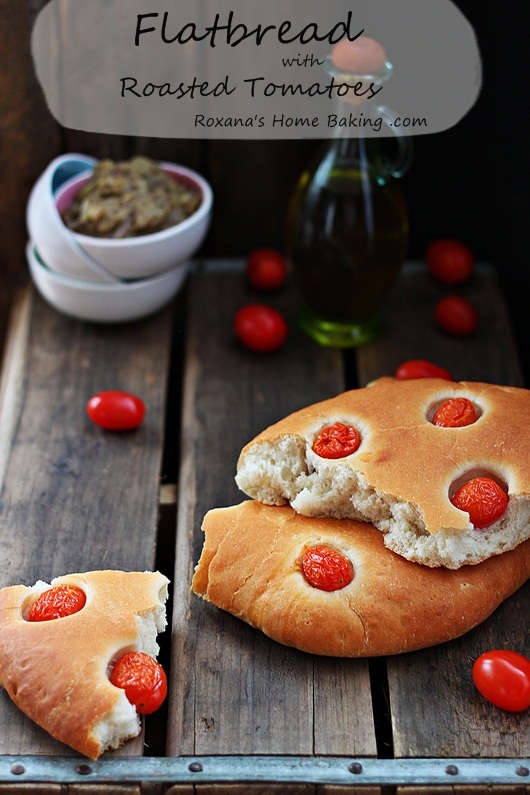 An easy bread which I would love to try! I looooooove working with yeast and this flatbread is making me very hungry! Roxana, this looks so, so good! Absolutely delicious! I love it! What a cool flatbread! I love how you pressed the tomatoes into it. Brilliant. Thank you for sharing with me. And thank you for your sweet words on my blog. They do make my day! I hope you are having a beautiful end to your week! Holy flatbread - this is stunning and what photography! These certainly are precious memories. Bread and Grandma. Mine never made bread but can just imagine the scene of her poking the holes. Bravo on your series, great idea! I love that this has minimal sugar! Can't wait to try it. THis bread is beautiful. Looks almost like brioche.